Here at the TABtouch Bettering Department we’re always looking at ways to better your bet. 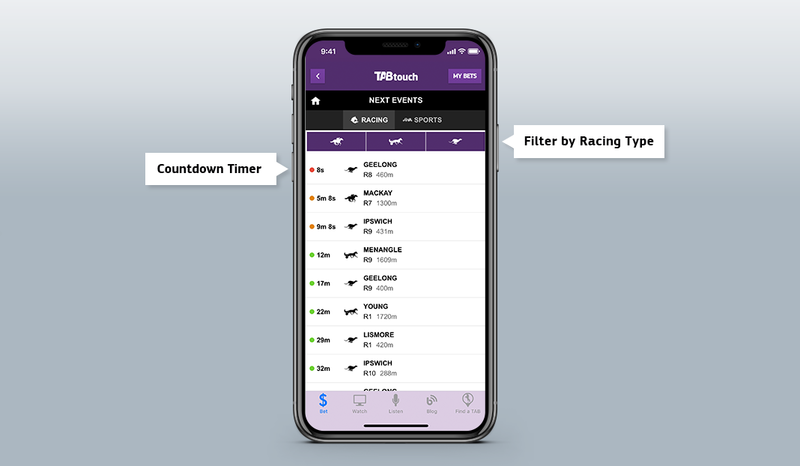 Next Events on the TABtouch app or mobile now gives customers a list of the 20 races next to jump. You can scroll through and select any of the races that are listed in order of their advertised start time. A countdown timer has been added to show the time remaining until each race’s advertised start time. In the case that a race runs late, the countdown timer will switch into negative and display how far removed the race is from when it was due to jump. You can now also customize the list of next events to display any combination of upcoming thoroughbred, harness or greyhound races. By de-selecting a racing code, the list will exclude any upcoming races of that race type. So if you only bet on the dogs, de-select the harness and thoroughbred icons and your list will simply display the next 20 greyhound races. Any feedback you provide us on new features helps us improve your experience. One of our team may be in touch if we need more information about your feedback.